This excellent DVD is part of the growing 100 Years War collection. Once again the BHTV team is supported by a re-enactment group, this time the Medieval Combat Society and by French historian Francois Wicart. Location filming and another crisp production of well lit footage has produced an enjoyable and absorbing account of one of the great European battles. Once again history repeats itself as terrain forces the conduct of war with battles fought over the same ground across the generations. 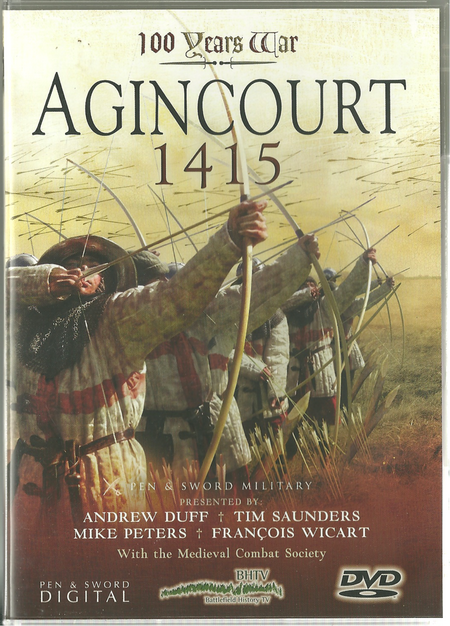 DESCRIPTION: This excellent DVD is part of the growing 100 Years War collection. Once again the BHTV team is supported by a re-enactment group, this time the Medieval Combat Society and by French historian Francois Wicart. BHTV has developed its own unique signature as a history video producer. The team provide a selection of members for each production and their experiences as soldiers, researchers and battlefield guides introduces a level of authenticity and knowledge that is so often lacking in other offerings covering similar topics that appear on broadcast television. In fairness to these lesser products, the presenters are not necessarily either interested in the subject, or knowledgeable. They would be equally comfortable developing their celebrity in any field and frequently with no greater success. There is also a feeling in made-for television history programmes that the broadcasters desire to introduce tension and suspense, as for a fictional work, has been allowed to intrude on historical accuracy and efficacy. BHTV clearly start with a balanced research programme and then film on location with a clear idea of where they are heading and a desire to remain grounded in the historic realities. The soldier’s eye always comes to the fore in a firm understanding of the importance of the terrain to the conduct of the battle or campaign being presented. Agincourt is yet another battle where English arms have triumphed in an most unpromising situation and in the lengthy conflict with France have provided another example of the apparent genetic ability of the French to firmly grasp defeat from the jaws of victory. Henry V was leading a small and depleted Anglo/Welsh Army, that was suffering widespread sickness, to safety and home. His Army included the famous Welsh archers who had contributed success to so many other battles. He also had batteries of the new canon, although these were not yet at the point of development to provide a dependable force and their weight was hardly helpful to a weakened armed force that was in retreat. Against this, the French had all the apparent advantages to ensure victory. They were present in significantly greater numbers, unaffected by sickness and a shortage of supplies, they were on home ground, and they were across the English line of retreat, with the advantage of waterways and crossing points to their favour. Historians will for ever argue about the reasons for this unlikely English victory, but the basic characteristics were again in view. The French pride and notions of chivalry of a military class of armoured knights did not stand well against the discipline, courage and endurance of a largely yeoman army where its noble knights fought on foot in the battle line with the yeomen. The English had a handful of men-at-arms and an even smaller force of artillery. The French notions of chivalry did not sit well with the new technology of gunpowder and the English were more effective in embracing and integrating this new weaponry. To the basic characteristics there are the intangibles of luck, weather and opportunities seized. What seems like luck is just a combination of opportunities presenting on the field and the ability of one commander to see and grasp favourable opportunity faster that the opponents. The Medieval Combat Society bring their knowledge and enthusiasm to the BHTV team and provide a level of detail that makes the distant past visible and vivid. As with other DVDs from BHTV, the viewer can feel part of the story and relate to the enthusiasm of presenters who have a great enthusiasm for their subject, a lifetime of related experience, and an ability to present in a fluid and understandable manner. Yet another great BHTV exposure of one of the great battles of history.